Hello and welcome to a rather different post here on VivaLaVidaFM. 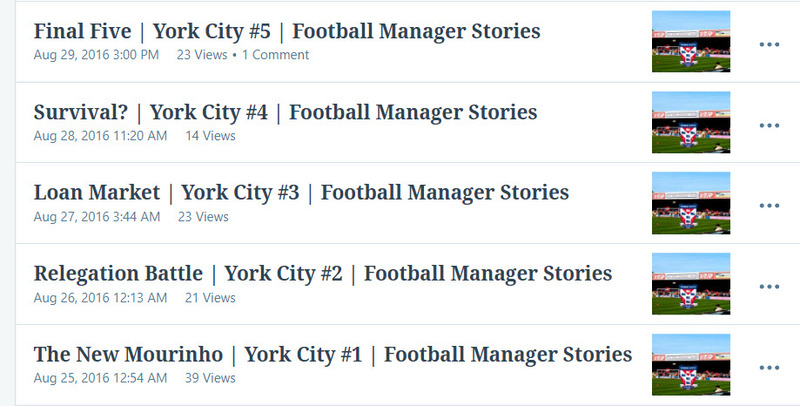 Over the past eighteen months, I have been lucky enough to be able to share my content with many different readers from all over the world and it is really humbling to know that so many people read along with my fictional Football Manager journeys. For those who don’t know, I’m Tom and I work full time in a special needs school. I work with teenagers with learning difficulties which is a hugely rewarding but stressful job. When I’m home, I spend a lot of time playing FM and now writing about it. What I want to get across with this post is how possible it is to see your own FM blog grow if you work hard and persevere. To be able to write about a game I love and have other people enjoy my experiences alongside me is something I won’t take for granted. The purpose of this post is to look back across the lifetime of this site to see how I have developed it into a blog that receives, on average, around 500 views per day. Just to clarify, I never intend for this to be a post of me showing off or boasting about how many views I get. There are so many other bloggers and FM sites who have far bigger audiences than me – take Higher Tempo Press and Passion4FM as two examples (and there are countless more). The idea behind this post is to help other FM creators improve their own content and websites in order to develop and grow. I’ll be using my own site as an example for some of the tips that I share. Therefore it is almost certain that I will miss things out – be that by choice, forgetfulness or simply not knowing. Please do get involved either on social media or in the comments section if you have any questions or extra tips that I may have missed. Each of these headlines will have sub-sections. For example in ‘Exposure’ there will be sections on Social Media and Guest Writing as well as a few others. Let’s start by thinking about the first thing you do when you have created your website or blog: creating content. My first few saves on this site were unplanned. What I mean by that is that I didn’t have a notepad with a framework of how each post was going to be set out. I didn’t think about how the sections of the post would link together to create a better reading experience. And that’s fine, I had only just started writing. It takes time to find out what works. Over time I have found that having a notepad is crucial to the improvement of my writing. Getting my ideas down on paper about what I want to write, how I’m going to structure each post and any little details I want to include really helps to produce a more readable post (in far less time too). 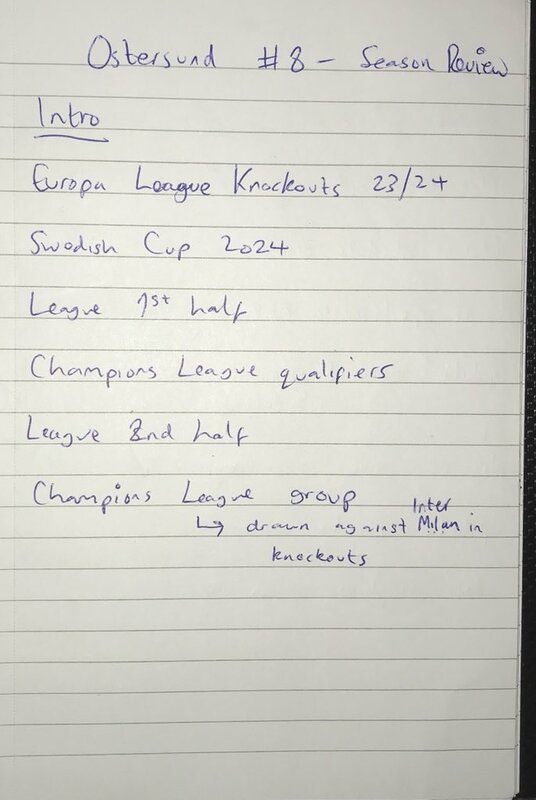 Here are some examples of plans I made for my Ostersund and SurpassingPep series (apologies for the scruffiness of my handwriting – I hadn’t planned on sharing these notes). As you can see, my planning is not too in-depth – I simply write down the sections I think I want in each post and add anything that I want to include. I think it is fair to say that I now take a greater interest in the view count of my posts than perhaps I did at the beginning. At the end of the day, I don’t want to spend hours on a post that nobody reads! However, I’m a certain that if you are just starting an FM blog, the view counts do not matter. It is all about the enjoyment. At the beginning of my time writing, my posts would earn between 0-5 views each in the week they were posted. You can see from the screenshot below that my earlier posts now have around 10-40 views each at the time of writing this post, around 18 months after they were first written. 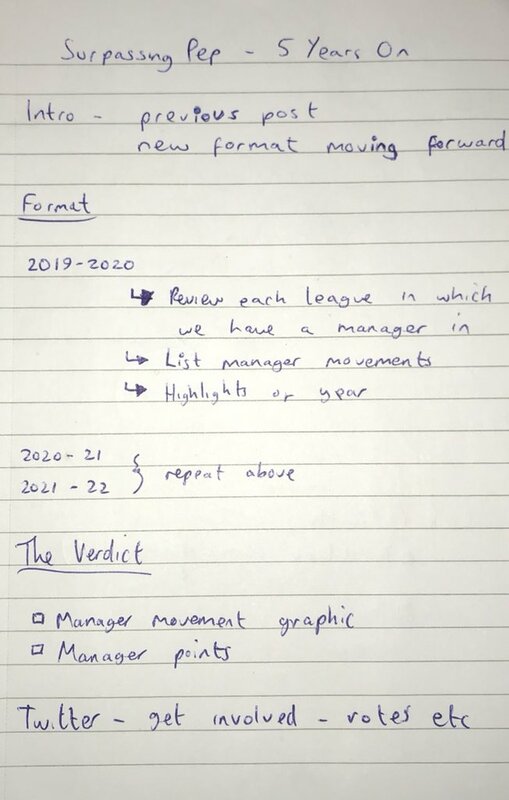 I started writing about Football Manager because I love the game and wanted to do something creative with it. The views really didn’t matter at the beginning and that is how it should be. But as you grow your blog it is only natural to start to care more about the views. Many of you reading this may be at a stage where you really don’t care about the views. And that is perfectly fine! 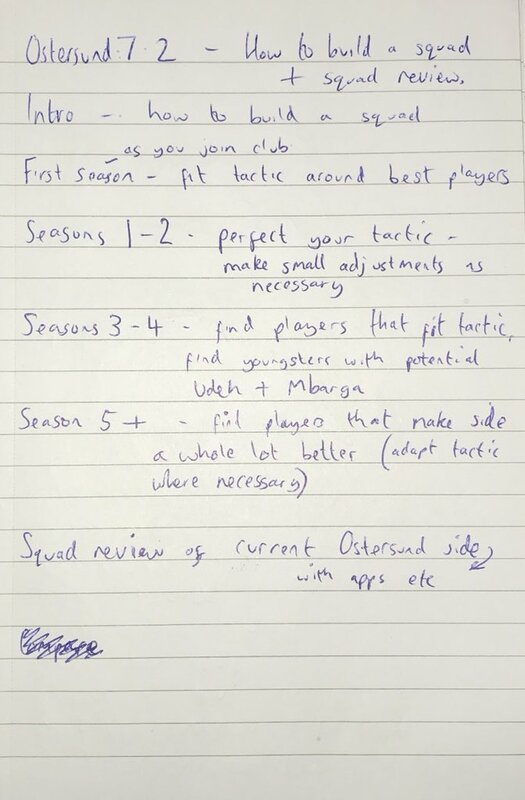 But I’m sure you still want to improve and produce better FM content, you wouldn’t be reading this otherwise, so hopefully some of the tips I’ll be sharing can help you to do this. This is a concept I first heard from Ricky Gervais. He was talking about his various sitcoms (The Office, Extras, Derek) in an interview where he said that these shows were all based on things that he himself had experienced. Gervais had previously worked in an office – his experiences there helped him create the award-winning show that first brought him into the public eye. I’ve taken this concept into my writing. I am no tactical genius – therefore I don’t set out to write posts like ‘Best Tactic in Premier League’ etc because I know I won’t be very good at it. What I do instead is try to interweave tactical posts into my story-based series. 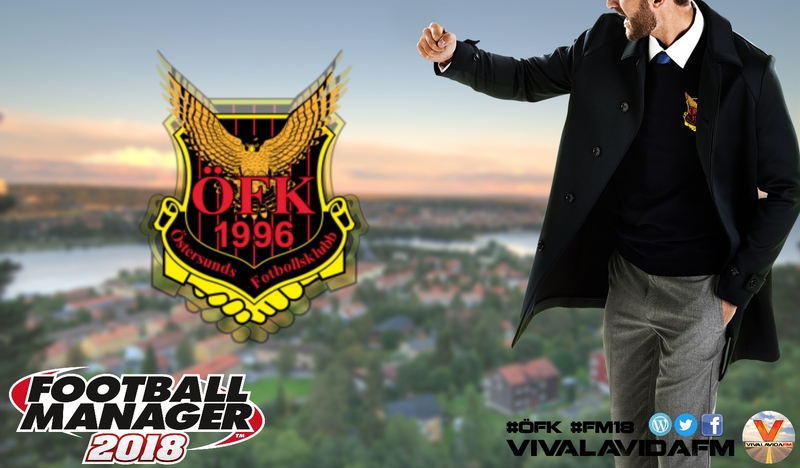 I did this here with Ostersund and I have done it previously in my VivaGlobetrotting save and even in one of my first FM16 stories with Venezuelan side Zulia. If you know more about creative writing (i.e stories) then write stories – don’t worry about the views. It is well known that experiments and guides tend to get more views than stories, but don’t write them just for the sake of it. You want to attract loyal readers – people who will read every post you write. Having said that, if writing factually is something you are strong at, guides are perfect for you! Essentially, play to your strengths. You can work on expanding your writing portfolio later on once your blog is attracting more readers. What is evergreen content? Evergreen content is content that is always going to be relevant. Now with Football Manager being the way it is – a new game is released every year – evergreen content can be difficult to produce. But in order to increase the popularity of your blog, evergreen content can be vital. My first evergreen post was a simple guide on 8 interesting teams to manage in FM17. This is a post that could be searched for the entire FM17 life-cycle, meaning it could attract views all the time people were searching for teams to manage on Football Manager. 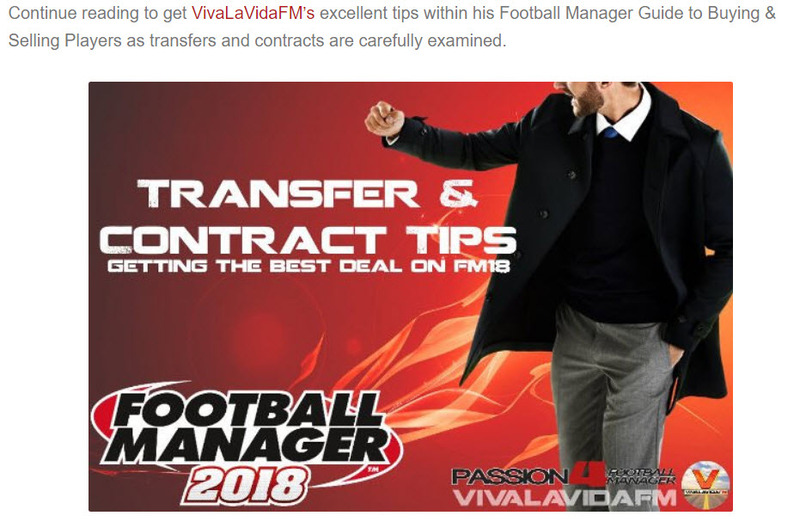 The post was put up in November 2016 when FM17 was first released. As you can see, this post was popular all the way through until FM18 was released around October 2017. So, the majority of the views of this post came from people searching on the internet as opposed to people finding it on social media (more on that later). This shows the importance of writing evergreen content if you want to grow your site. Just 1 post was attracting an average of 150 views per month for eight months or so after it was released. The last thing I want to speak about in this writing section is consistency. You need to find out what works best for you in terms of how often you release a post. I found that I am happy writing 2-3 posts a week, for some it may be more, for some it may be less. But what you don’t want to do is release two posts in two days and then nothing for two weeks. It can make people invested in your story only to then have to wait two weeks to find out what happens. A point that ties in with this is longevity. If you are consistent for a month – that’s great. But your blog won’t grow if you then disappear for a month. I have been consistently blogging for 18 months and it is this longevity that has seen my site grow. Another element that relates to consistency is what you write. If you are writing about a save, try not to just stop that save and move onto another one. If people are invested in your team – they will most likely not want to risk investing in another save only for you to stop again. My VivaGlobetrotting save from FM17 lasted 50 posts and my current Ostersund save has gone past 15. It is fine to have short-term series, for example CasualFM’s completed Gornik Zabrze series (5 posts), but an incomplete series must be frustrating for the reader. Just a small thing to write about, but linking to other posts in your articles does help to increase the time somebody spends on your site. Ideally, you’d want a person to read every single post you’ve written and then read them all again. And then again. But realistically most people will read the post they’ve clicked on and then leave. To encourage more people to read other posts you’ve written, link these in your posts! In my story posts I tend to share a link towards the beginning of the post to the previous instalment, meaning people who missed a previous post are likely to go back and catch up. Until recently I hadn’t noticed an effect of this, but after posting my latest SurpassingPep post (#3 in the series), I noticed that a lot of people were reading parts #0 and #1 as well. But why weren’t they reading #2? Because I hadn’t linked it! You can see above that I have updated the post to include links to #2 as well. Fortunately for me, I noticed the trend early enough to update the post whilst it was still being read. This really helped increase the number of views of #2 – without the link many people may not have bothered to go back and find it. Plan what you want to write, write because you enjoy it, write about what you know and aim to write consistently. This will see your blog grow! (And an evergreen post is sure to help). People will find your content organically (through search engines like Google) but this takes time. Your post won’t immediately appear on the first pages of a Google search which means that your post is not likely to be seen. You need to share your content and in this section I put forward some of the things I’ve learned about website exposure in the 18 months of running this blog. We’ll start with the big one – social media. Towards the beginning of your blog’s life, social media will be where your site will gain most of its exposure. Your blog posts won’t be ranked high enough in Google searches to attract organic viewers and so your only views are likely to come from social media. As you grow, search engines will direct more traffic to your blog as your posts will become more visible. But social media remains an important part of your online presence. Here is a good example of how, over time, social media takes a step back in terms of attracting views to your site. Over half of my views from November 2016 came from social media compared to just under a quarter of views 1 year later. Unfortunately, I don’t have any WordPress stats from when I started my site in August 2016, but I am almost certain that there would be more views from social media than there would from search engines. However, this doesn’t mean that you shouldn’t focus on your social media accounts. I mentioned earlier about online presence, what I meant by this is how well-known you are in your community. If you are well-known for producing enjoyable content, people are more likely to share your content to help it reach a wider audience. And so building a following on social media could really help to grow your blog quicker than it would without social media. I know that for me I would not have continued blogging if it wasn’t for social media. The interaction you get from sites like Twitter makes the whole blogging experience so much more enjoyable. By having a greater following on social media you immediately have x amount of followers who will read your latest post. You also have x amount of followers that will give advice, give encouragement and give critique when needed. This is, in my opinion, crucial in improving your blog. I first want to talk about Twitter. Since joining the site with an FM specific account in September 2016, I have grown my following to over 1000 people. It is important to realise, however, that this doesn’t mean I will have 1000 people clicking my latest blog post. It really is just a number, what really matters is interacting with other people and being part of the FM community – #WeAreTheCommunity is the hashtag we use on Twitter to find other FM content. If you just share your own post and leave it at that, why would anyone click on your post over someone else’s who they know and have regular interactions with? Having 100 active followers who you interact regularly with is so much more valuable than having 1000 inactive followers. I use Facebook to share every post I write but I don’t mind admitting that I haven’t quite figured out a perfect way to use the platform. I have a page created for my site (you can find it here) where I post all of my site updates. From here I then share each post on several Football Manager groups that are set up on FB. With nearly 40,000 potential viewers of your post, you could see your post become popular and attract more views. However, unlike Twitter, where people can mute you or unfollow you, it is important to remember that you are posting in a group and that many other followers of that group won’t want to see endless spam-like posts of you sharing your content. I stick to one post per day at most to make sure that I’m not over-sharing in the group. I’m still learning the best ways of using Facebook. My page has just over 180 likes but I find that the posts I share reach fewer than 10 people when I don’t share it to any groups. I am personally a much bigger fan of Twitter, but Facebook does still contribute to your online presence. 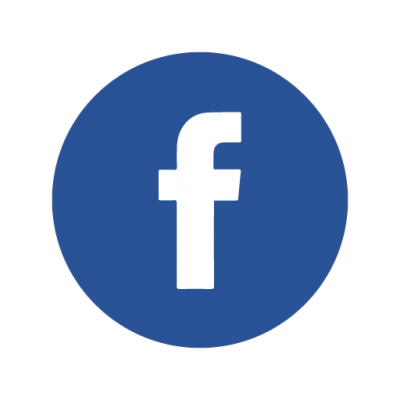 Many people only use one social media platform, so if you only post to Twitter there could be hundreds of potential readers on Facebook with no idea you are writing. 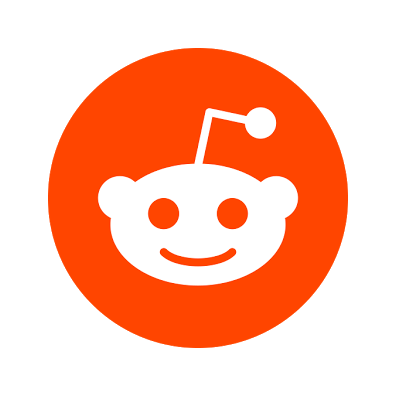 Reddit, when used correctly, can be a great site to use to promote your content. The subreddit I use has over 43,000 subscribers, which is a massive number of people that could see your post. 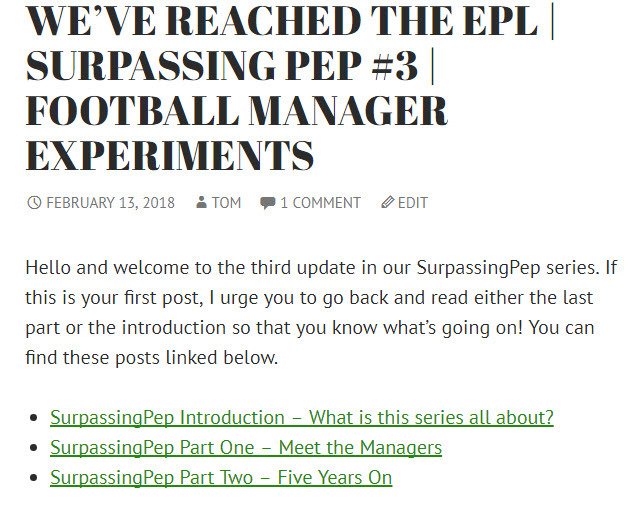 Prior to releasing this SurpassingPep post on 13th February, my most successful day (looking purely at view count) was in August 2017 when I had roughly 1400 views. This post took off on Reddit and led to me more than doubling that view count on February 14th as I finished the day with just under 3100 views. So this means you should post every article to Reddit, right? Wrong. I only submit my posts to Reddit if they are experiments or specific posts that I have spent a lot of time working on. I have tried in the past with posting my stories but it seems to be frowned upon. I can understand this to a point, it isn’t morally right that someone posts their own content into a forum that they don’t use purely for self-interest (more views). On the other hand, the amount of memes that are shared there and attracting hundreds of upvotes is frustrating when a piece of writing that you’ve spent hours on is downvoted and mostly unseen. But that’s the way that particular subreddit is, there are other subreddits that have been created purely for promotion purposes but these are seldom used. The final social media platforms I wish to discuss are Slack and Discord. I freely admit that I have yet to use Discord, but from what I have heard on Twitter it is a great place for chatting with other creators and FM fans. But, like I said, I haven’t used it so won’t delve any deeper into that platform here. Slack is a platform I have used regularly. It has been running since December 2016 and is a place where you can create your own channel for others to join and discuss specific topics. For example, there are channels for discussing tactics, real-world football and much more. You can create a channel that talks about your own FM save – I have done this for my current SurpassingPep experiment. There is a channel made specifically for sharing your content (#WeAreTheCommunity) which I post in whenever I release an article. By interacting and being active on Slack or Discord, you are creating relationships with other creators and readers that will help you to grow your site. It will, perhaps more importantly, help to increase your enjoyment of the game too. Get involved on social media, interact with other people and increase your exposure by sharing on multiple platforms. Your use of social media is vital when growing your site. I’ve been lucky enough to have written posts for three different Football Manager blogs / websites. I’ve written a couple of Chilean football club guides for The Higher Tempo Press, one Chilean league structure post for Keysi Rensie and three posts for Passion4FM. How does guest writing give you exposure? Does it help increase views on your own blog? Here is the introduction to my post written on Passion4FM. You can see from the image that my name is highlighted as it links back to VivaLaVidaFM. The idea is that people will click on my name and visit my site to read more FM content there. From looking at my statistics, guest posting doesn’t appear to help my site at all. In 2018 alone, I have had 3700 views come to my site from social media. I have had just 20 viewers come through the link on my guest post. This makes sense though. If you have just read a post, even if you have enjoyed it, how many of you would scroll up to the top to find out who wrote it? Would you bother to find out more about the author? I wouldn’t! In my opinion, the main pro for guest posting is the exposure given to you on social media. It is here that you will grow and garner more views. 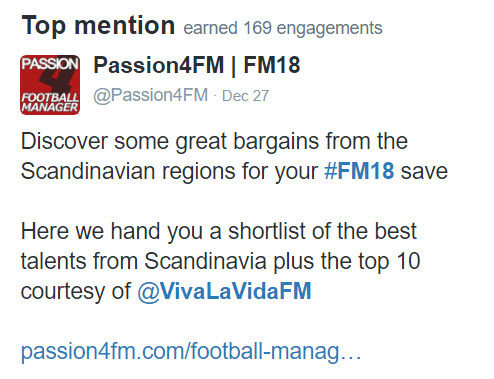 For three months running my top mention on Twitter was from the Passion4FM account (followed by close to 15,000 people). In promoting my post on their site, they were also promoting my Twitter account and my name. More people would become aware of my online presence which would, in turn, increase my popularity. I have found this to be the best part of guest writing for bigger sites. I’m sure others may have different opinions so I encourage you to leave them in the comments section! So, we’ve talked about creating your content and sharing it around. But how do you convert a one-time viewer into a consistent reader? Since creating my site with WordPress I have spent a lot of time ensuring that my website is pleasing to the eye and easy to navigate. In the first few months of VivaLaVidaFM, I had the unofficial rule of doing one thing every single day that will improve my site. This could have simply been changing an option in my sidebar or it could have been something more adventurous like migrating my host server. 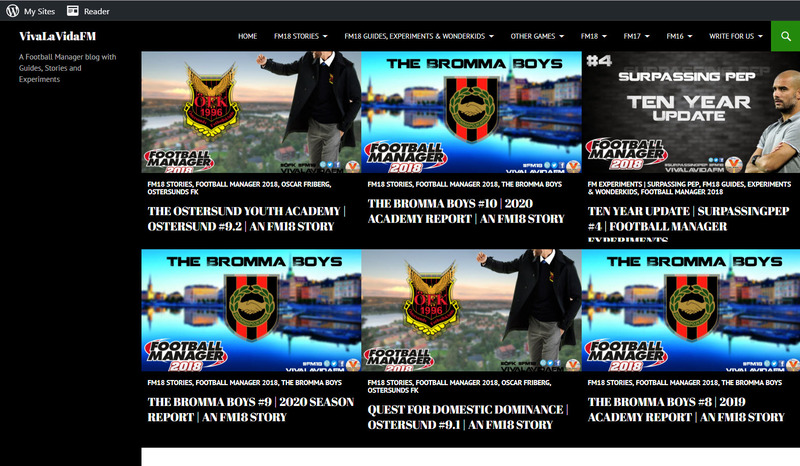 In this section of our guide to improving your Football Manager blog, I’ll be looking at several tips to help you improve how your website works in order to entice more readers to stick around. A person has found your site and read their first post. How will they find another one of your posts? I’ve mentioned before how linking to other posts in your article may encourage a viewer to read another post, but should your reader choose not to click on these you need to have another way to help your readers find what they want. Here is my homepage. In the theme I am using on WordPress, I can feature 6 posts to stay at the top of the page – I tend to just use my latest posts but I could feature my most popular posts here instead. Above these featured posts is my main menu. For each dropdown option, there are sub-menus that label clearly what people will find there. I really do think that having a clear menu helps to retain your audience. There have been several occasions where I have gone to read a blog post on another site and wanted to read the previous part but haven’t been able to find it. Of course, if I had tried hard enough I could have found their previous post, but most people won’t bother. When designing your site, imagine you are designing it for a lazy reader who is only on your site to read one post. You need to make it as easy as possible for that reader to find more content and be intrigued enough to navigate to it. After creating a post in WordPress you have several things to do before actually releasing the post. 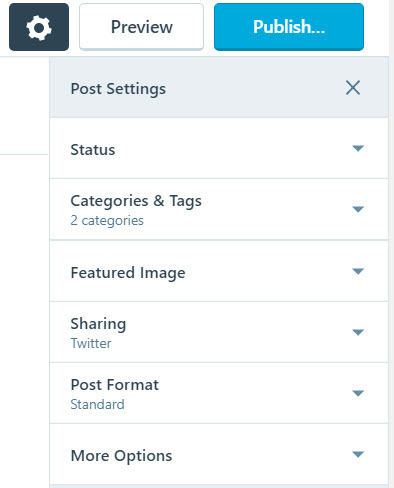 You can see these options from the screenshot to the right – Status, Categories & Tags, Featured Image, Sharing, Post Format and More Options. ‘Status’ allows you to either publish your post straight away or schedule it to release at any specific time and date. ‘Featured Image’ allows you to add a specific image to use as the thumbnail of your post (to be discussed in the graphics section). ‘Sharing’ allows you to create a social media post to be shared when your article is released. ‘Post Format’ allows you to change the style of your post (this is something I have not touched since creating my blog, but there may be some options that interest you here) and finally, ‘More Options’ gives you the chance to create your own blog post URL. In the screenshot to the left I show the categories that I will use for this post. As it is a guide I will place it in the Guides category. 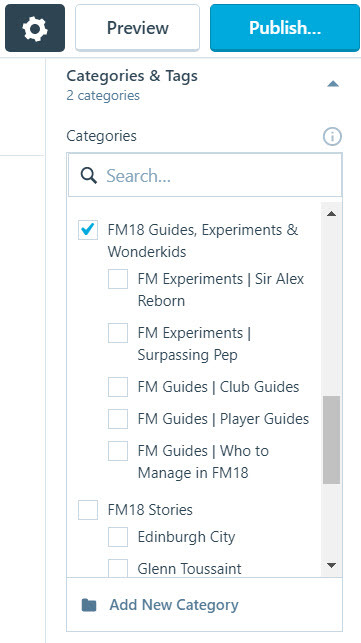 This means that when you click on the FM18 Guides, Experiments & Wonderkids link in my menu you will navigate to a page that shows all the posts in this category. One problem with the WordPress system is that blog posts in the category pages are listed non-chronologically, the posts are listed with most recent first (Sir Alex Reborn: example). The latest post is at the top of the page which may not be helpful for a newcomer to the series (they would want to read Part 1 first). One thing you might want to consider is creating a page for each of your series that lists each post in the correct order, starting with the first post and being updated every time you post in that series. What this does is it encourages readers to begin your story from the very beginning, allowing them to fully immerse themselves in your series rather than joining midway through. It also allows readers who have joined halfway through an opportunity to go back and start from the beginning. Without these pages, readers will have to scroll down to the very first post by using the ‘category’ page. This takes time and, like we hinted at earlier, a lazy reader will just give up and leave your site. Your sidebar is the area to the side of your post with extra information and options for your reader to think about. In the screenshot you can see the options I have available in my sidebar. Bear in mind that each WordPress theme may have different layouts and options, I am focusing purely on my site design. At the top of my sidebar is an option to search my site. This is an important feature you want to include in your sidebar as it allows your reader to search for a specific word or phrase across your site. Say a reader wants to read posts about Spanish football – they can search this and find all of your posts on topics they want to read about. Have a look at my sidebar now, what things do you see that might interest you? Is English your second language? 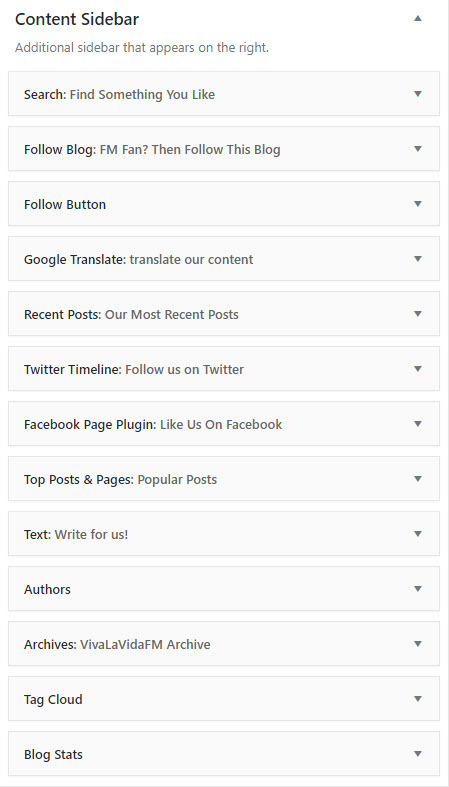 Perhaps you’d like to translate this page into your native language – there is an option for that. Do you want to read my most popular posts – my top 10 most popular posts are listed. Do you want to contact me on Twitter – there is a link to my Twitter (and Facebook) in the sidebar. Essentially, you want to use the menu and sidebar on your site as the place where your reader can improve their experience on your site. A happy reader will return to read on your site again and again. As you grow your site you really want to try and increase the ‘brand’ of your site. You want people to recognise your name and identify you as a person who writes decent content. We touched earlier on the importance of growing a social media following and online presence; one thing that is important in growing your ‘brand’ is having a consistent graphic that people can identify alongside your name. My first logo (left on the above image) was made using a program I found through google search. It is very simple and clearly identifies who I am. The second logo is my current logo that was made using Paint.net. For every thumbnail I create and every social media platform I am on, I make sure to use my logo as my profile picture. Whenever someone sees this logo they can associate it with my site and it builds an awareness of my site. I am no expert on branding but it’s why successful brands work so hard on producing a recognisable logo – it ends up with more people buying their product. Having consistent graphics on your site means using consistent thumbnails for your series. If people begin to recognise the thumbnail, they are more aware of your series and therefore more likely to read it. To summarise, take some time to organise your site menu – people will be more likely to read several posts on your site if they can actually find what they want! Create pages that list your content in chronological order, it helps save the reader time when trying to read your posts in order. Encourage your readers to interact with your site through the sidebar and make sure to have consistent graphics on your site. I’ve spoken a little bit about the importance of graphics across your social media platforms, on your website and within your posts. In this section, I’ll look in more detail about the types of graphics I use and why it is important to use a range of graphics. I’m only going to speak about the graphics that I use on my site or across my platforms, there will obviously be some types that I miss out. Do feel free to leave any that you think of in the comments section below! Easily the most used graphic in my blog posts are screenshots. Screenshots add a great visual representation of what you are talking about in your post, for example if you won the league in your save, add a screenshot to allow the reader to see how you won it. I try to make sure that I use a screenshot every section to break up my text. Some readers may be put off by a big wall of text with few images. I rarely use images from the internet in my blog posts. I tend to just use screenshots from FM to represent what I am talking about. But if you do use images from google one thing to make sure about is that they are available to be used elsewhere. You can do this by selecting the option ‘Labeled for reuse’. Any images shown when filtered by this option are able to be used elsewhere without risk of breaking any copyright laws. I use a software called snagit for screenshots on my laptop. It is a really good piece of software and is much quicker than my previous method of pressing print screen and pasting into paint (this used to take AGES)! In the previous section I talked a little about having consistent graphics on your site. For any series you run with more than one post, try to make sure that they all have the same thumbnail. It just means that a reader who read the first post can instantly recognise the next post in the series. A reader may only want to read the one series on your site so you need to make it as easy as possible for them to find what they are looking for. It also helps to increase awareness of your series. If somebody sees your thumbnail more than once, they may become curious as to what the series is about. On my thumbnails I always include my logo, name and small icons that indicate which social media platforms I use. Take a look at the thumbnail below. Having this consistency among your thumbnails further enhances your ‘brand’ as it links all of your thumbnails together and to your site. You can see on the above thumbnail that I include my logo and social media icons in the bottom right corner. I am consistent in that I repeat this in all of my thumbnails. I also include the logo of Football Manager in the bottom left and then I always tend to have the club badge somewhere on the thumbnail. I create my thumbnails in paint.net. It takes a little time to learn how to use this software but it is absolutely worth it. You can download it for free here. GIFs are a selection of images knitted together to form an animation. The above example shows an example of a GIF I created for one of my Football Manager posts. Using GIFs in your blog posts or on social media adds an extra level to your content. It allows the reader to easily compare a selection of images, in the above case, or to see an event that might have occurred in game (for example – a goal). One thing to bear in mind when using GIFs in your blog posts in the file size. GIFs are much larger than normal images and will take up more space – this could make your page load more slowly, depending on your host. I make my GIFs in GIMP, a free software you can download here. I’ve only recently started to add graphs and charts to some of my posts, though only fleetingly. This is another type of graphic you may want to consider adding to your posts in order to help the reader – some readers may find them really useful to add to what they’re reading. I use the website meta-chart to create my charts and graphs. It’s free and allows you to select a variety of graphs to use. Infographics are another type of graphic I have tried in my blog posts. As you can see from the example to the left, they are small graphics designed to contain information. 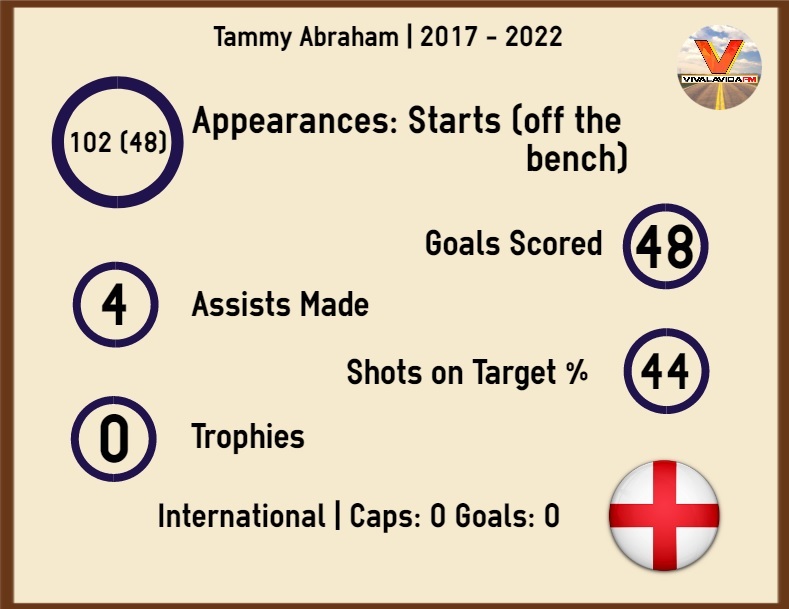 So instead of simply writing out that Tammy Abraham made 102 appearances and scored 48 goals, it’s nice to put this information into an infographic to allow the reader another way of seeing the data. So, why is it important to use graphics in your blog posts and on social media? You’ll have noticed that I’ve threaded into the above section why I think graphics are important. Essentially, you want to engage your reader and to do that you should aim to use a variety of graphics. On Twitter, it has been found that the most successful tweets contain images. People like to have something visual to go alongside what they read. Make good use of graphics on your site, in your posts and on social media. Try to use a range of graphics without overdoing it. Be consistent and engage your audience! In the final section of this post, I look at two little factors that might make your time running a website more enjoyable. I have only recently begun to set targets for my site. I’ll be sharing these targets below. But why have I set targets? What’s the point? For me, the point of a target is to give me extra motivation to continue to look to improve my writing and my blog. It would be easy to keep on writing the same stories in the same way but I always want to improve and get better. Setting targets will help to remove any complacency I might have in running my site. What are my targets for 2018? A lot of my targets are based on what happened for me in 2017. My blog earned 148,000 views in 2017 – so what’s the next realistic target? 200,000 views in 2018! Each month I am comparing the number of views I am getting this year in comparison to last year, if I beat each month I will be well on the way to reaching 200,000. The next target I set is related to WordPress followers. Now I haven’t really spoken about WordPress followers in this post as I don’t really know how effective they are. But basically each time you publish a post an email is sent out to all of your WP followers with said post. It seems only logical that the more followers you have, the better! I had 47 followers at the end of 2017 – my target for 2018 is to reach 130 followers. My final target in relation to WordPress is to improve the number of views my authors get. Towards the end of last year, I made an effort to invite more authors to write on my site. I have set two targets concerning authors: 1) Have 5 authors reach 1000 views for the year. 2) Have 1 author reach 10,000 views for the year. The final targets I have set are to do with Twitter and Facebook and they are as simple as increasing the number of followers on both sites. For Twitter I want to reach 1500 followers and on Facebook I want my page to reach 325 likes. Here is how my site is progressing towards these goals as of 1st March 2018. I mentioned at the beginning of this post that I have a full-time job in education. Writing a blog takes away some of the stress this brings as I can focus on something else, I can write about something I love doing. But it does take up a lot of my time at home and so it is crucial to take a break every so often to avoid getting burned out. Last August I planned to write a post 5 times a week as it was my summer holidays. But towards the end of the month I just wasn’t enjoying it and decided to take a break from FM until October. This worked wonders for me. I played other games (and even wrote about Motorsport Manager here) and generally just had a break from the game. 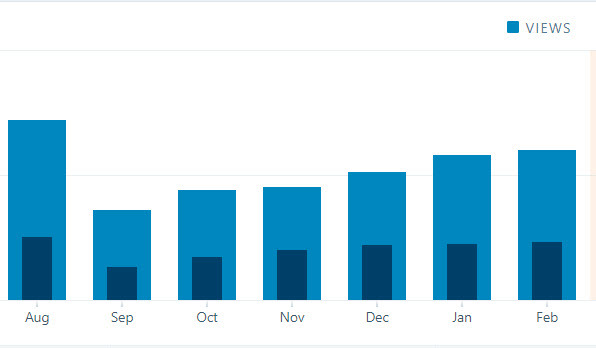 Since September, my blog has gained views each month. I am sure this would not have happened if I didn’t have that break. To see this steady climb is very rewarding for the hard work I have put in on the blog over the months. August 2017 was my best month by far in terms of views, but in terms of quality I like to think I have stepped things up since the release of FM18. Set yourself some realistic and achievable targets to keep you motivated throughout the year. Take a break from Football Manager every once in a while – avoid getting burnt out. Thank you very much for getting this far! It has been very fun writing this post and sharing my journey with you all, if you have taken even just one thing from this post then I’m happy. If you want to follow me on my social media platforms, check out the links below. Thanks again for reading. 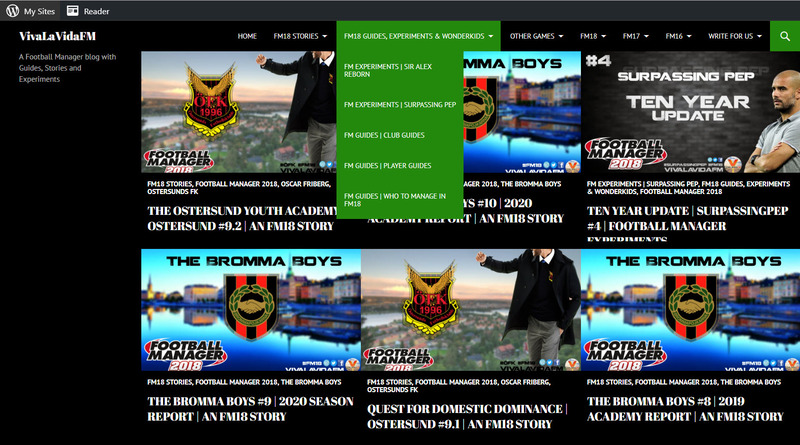 This entry was posted in FM18 Guides, Experiments & Wonderkids, Football Manager 2018 and tagged fm blogging, fm18, football manager, improving your website. Bookmark the permalink. What an amazing post mate! Fantastic work! I didn’t know that guest posting doesn’t have much effect unless the link isn’t placed on the social network. Excellent post! –Do you think I could have some success starting a save in an old version of FM (like, 2007) rather than FM2018 or 2019? I can’t help but wonder if readers would be interested in reading about one of the “old-school” versions of FM, given that the series has evolved and grown so much since those days, and SI releases a new version every year. You made a great point when you wrote about evergreen content, and I wonder if that’s too much of a hurdle, or if there are others out there that are still into older versions of the game. –Do you have any thoughts or ideas on potentially monetizing a FM blog? I’ll likely blog regardless, just for fun, but I don’t know if FM is the type of game that would fit well with any sort of affiliate program, or if there’s another way to actually make money off an FM blog. Thanks for your time, and thank you again for a really insightful and encouraging post! Thanks Nick, you are more than welcome! I think you could have success with an older version. With story posts most of the views I get come from sharing on social media rather than people finding them through google, so if you can engage your audience on social media then of course it can be a success. Story posts are rarely evergreen posts as once the new game of FM is out people search for stories for the newer game instead. The key to succeeding with story posts is growing a ‘fanbase’ of followers on social media that will read your content regardless of which version it is on! As for monetizing a blog, it certainly is possible as I have done it. However from my experience it isn’t too worthwhile. From 9 months of having adverts on my site I earned around $60 (this was when I was receiving around 10000 page views per month on average). I also found that the adverts were intrusive, appearing within my blog posts, and I decided to remove them. Such a good read, has definitely helped me rethink my strategy for my own blog.